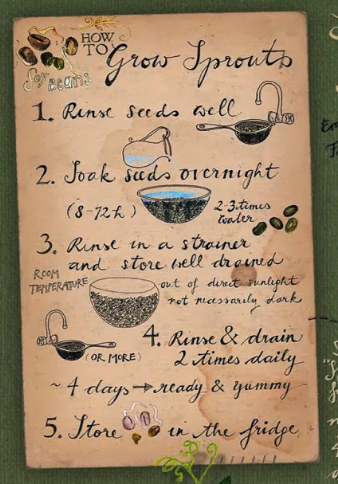 Organic high quality seeds can be powerful healers - if you keep them away from heat and prepare them in a way that makes their nutrients available to your body. 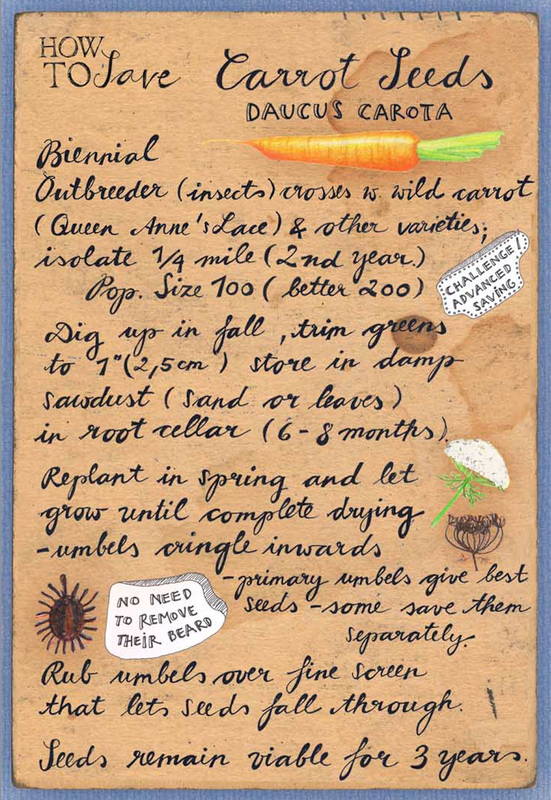 Be it sprouted, like in the how-to card below, ground, soaked or as cold pressed oils. Just don't cook or roast them - and while sunflower and sesame pate are wonderful, check that they are not made from roasted seeds. If you are knew to seeds as medicinal food, I would recommend to start with this article about "the ten healthiest seeds" as inspiration to explore more. 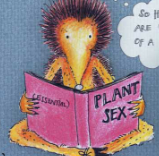 Aside from their medicinal effects, seeds are also super-tasty! This allow us to integrate them creatively and step by step into our diets. I thought you will probably like new recipes for new powerfoods at hand - so I have listed the seeds below, then their effects, shortened, followed by a link to a search on pinterest. This list will be updated with other articles and links over time - selected articles are always welcome in the comments ! It is a wonderful awareness ride to collect more health knowledge - where-ever we are born, nature has prepared a pharmacy directly in front of our doors, supposed there is some healthy nature around. 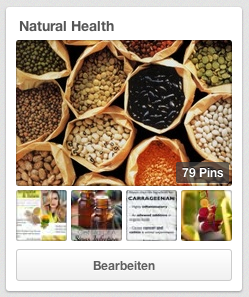 I collect my links in a folder (board) "Natural Health" - being still new to the topic, but it is soon time to divide it into subtopics, i guess. 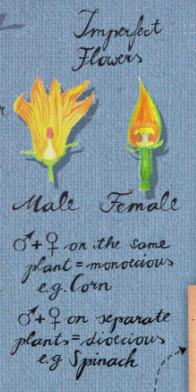 That is the moment when you can re-check how much you still know about the plants mentioned and re-read some articles. 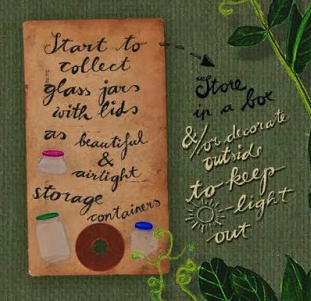 And here is your simple How-To card for growing sprouts ! 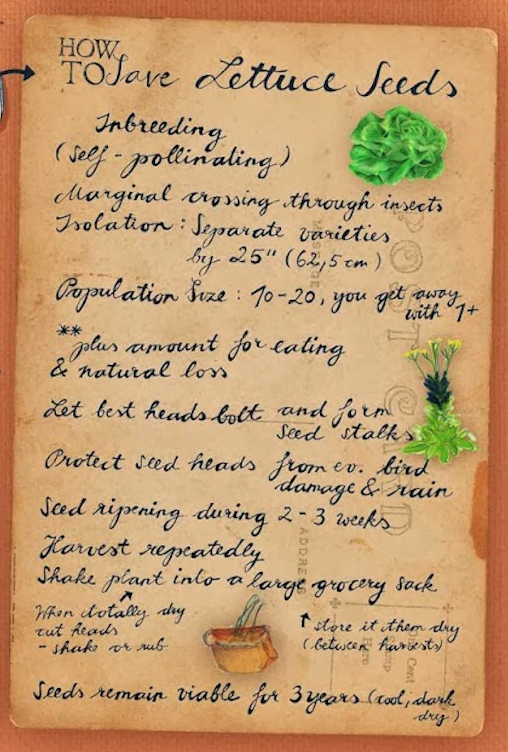 Sprouts are really easy and super-healthy, but be sure to rinse well and take your time to read about the specific seed variety you are going to sprout online before you start as there are some differences to be aware of. 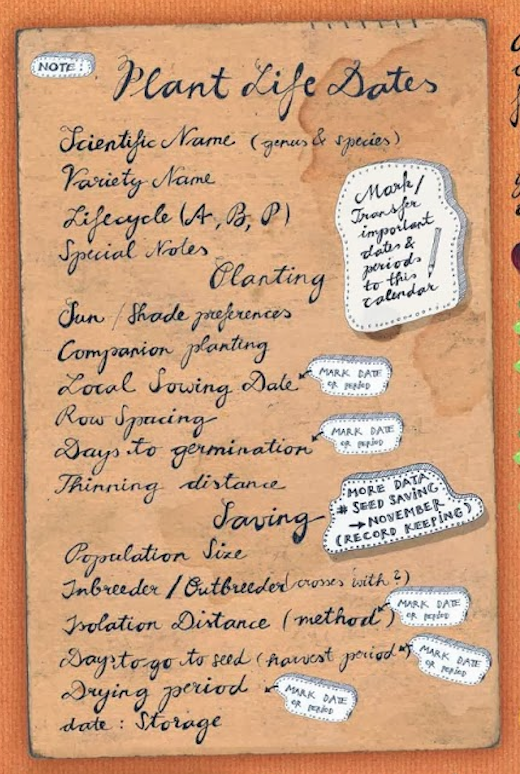 Sproutspeople offer you tons of valuable information - and though a strainer and a pot are in principle enough - maybe you enjoy some fancy equipment for sprouting. To stay on the very, maybe overcritically safe side, read this wikipedia article before you start your sprouting journey - and avoid to eat more than 550 g sprouts a day on a regular basis. Something that is unlikely to happen to me - though i love sprouts, and yes, start with small amounts of seeds for sprouting, unless you plan to cook with them. They are also a nice present for friends, in a nice glass, from the fridge through the winter night, for a dinner salad - ideally with healthy oils ! 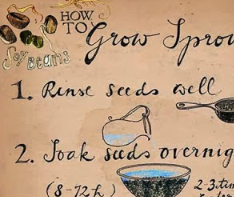 Enjoy sprouting and to explore more healthy seed recipes ! 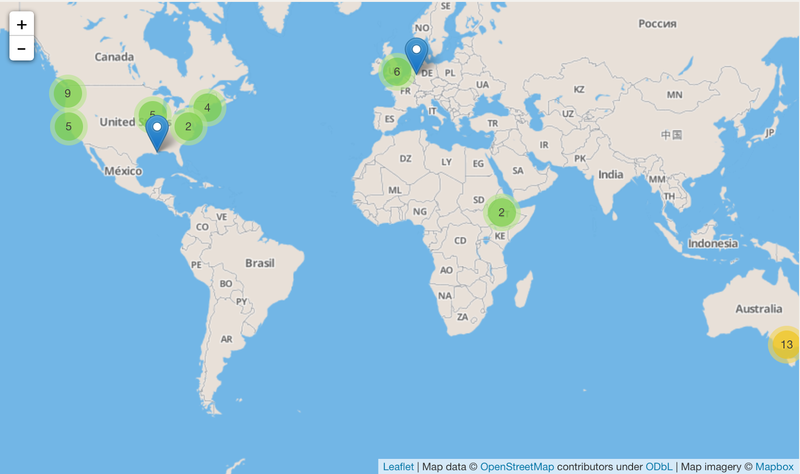 Post updated in September 2014: now you can put yourself on a map and if all of us do it, soon find other seed savers ! 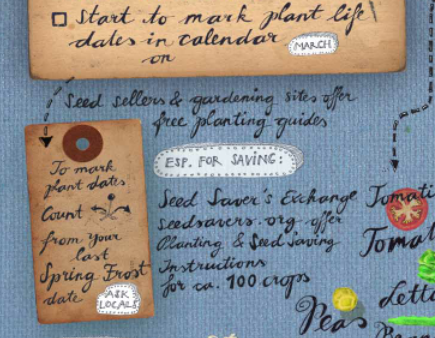 Which seeds to order, grow and save - which to avoid for seed saving. Oh, those seemingly endless varieties - it is still seed ordering time ! choose only seeds which are marked "OP". 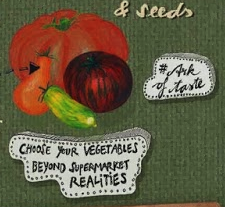 No matter if you want to save money, take control over your food quality, be part of a peaceful revolution or all of them: only seeds from "open pollinated" plants will grow true-to-type and thus work for seed saving. 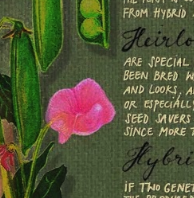 The third description you often find in seed catalogs or on seed packets, is "hybrid" - avoid them for a start. Hybrids are crossings between two not closely related parent varieties and often very prolific plants. Nature can produce hybrids too, when bees cross your broccoli with your cauliflower, for example. 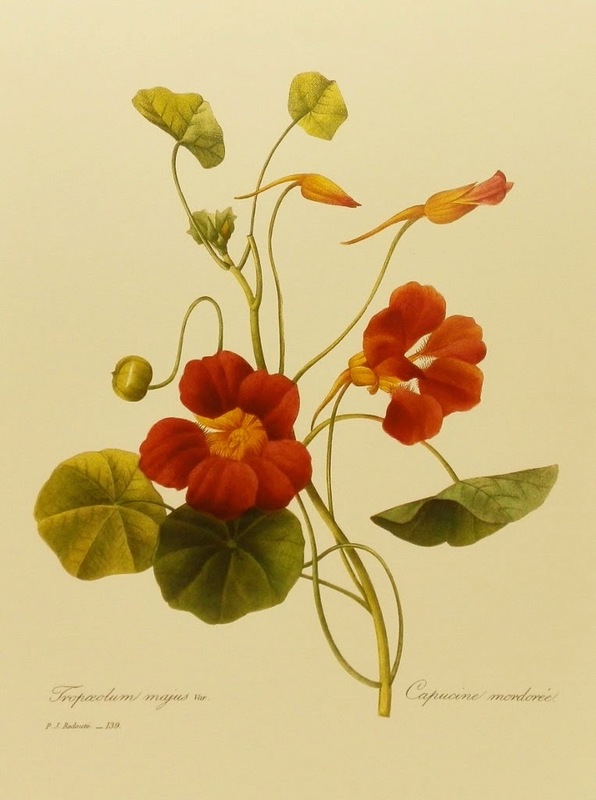 But for seed saving, hybrids are not suited, as the following generation grown from saved seeds from these plants will not carry the same, if any harvest at all. 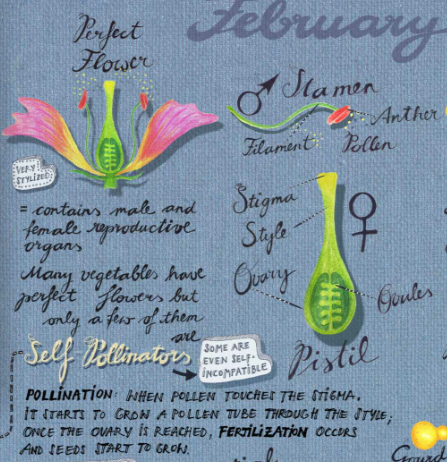 This is why saving pure seeds requires protection from cross-pollination for many plants once they start to flower, which is explained on the "April" calendar sheet. 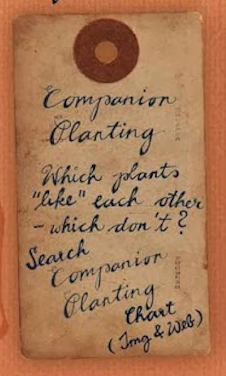 This again is the reason why many people hesitated to go deeper with seed saving - but with the calendar you will realise that all methods are simple and can be realized from cheap materials; And once you got infected by the magic of re-connecting and co-creating toward abundance, you will see that it is big fun. 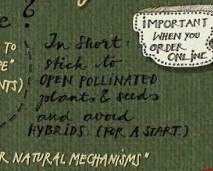 You will even learn to cross plants and create your own hybrids, but if you want to choose plants to save from, and don't plan to experiment for a start, skip hybrid plants if you order seeds. Enjoy to explore trusted sellers online , in search of special plants you want to grow, dreaming up your garden over the year. 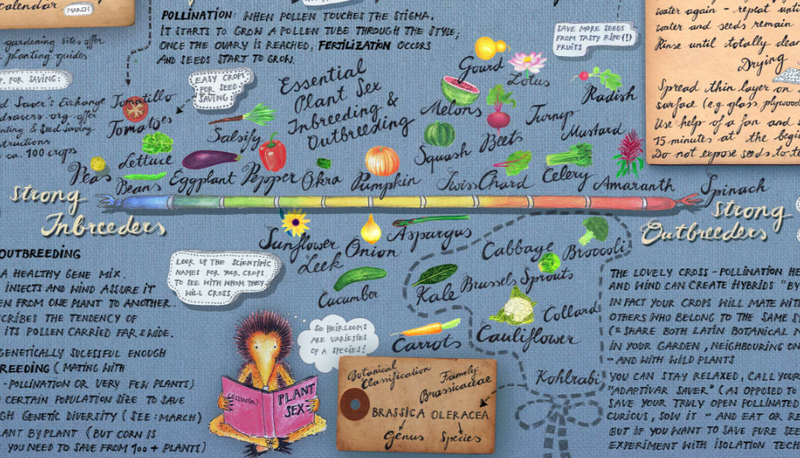 If you want, get inspired by "Ark of Taste " and the slow food movements' list of especially tasty threatened culinary varieties, all of them heirlooms - old varieties which have been around since more than 50 years. Regional varieties, but the movement is international. Humanity is at the start of becoming aware of the importance of seed saving, so it is likely that there is no seed bank or seed library next to you yet. 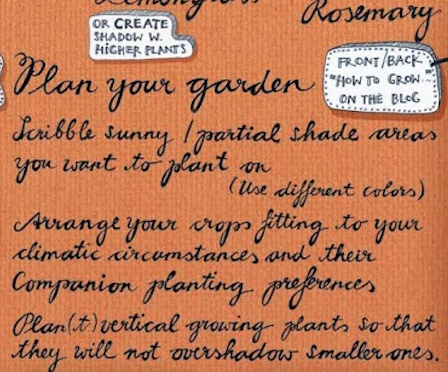 You will learn in March, that several species require a quite large plant population to save from, which can easily be done if you convince some friends to plant the same variety and save from their best plants, too. When I created the calendar I deeply desired a platform that would allow to find everyone who grows and saves from the same variety and facilitate exchange. It would make the movement increasingly aware of its size on a global level, and once it has grown ( become well-known) allow us to find others on a local level too. 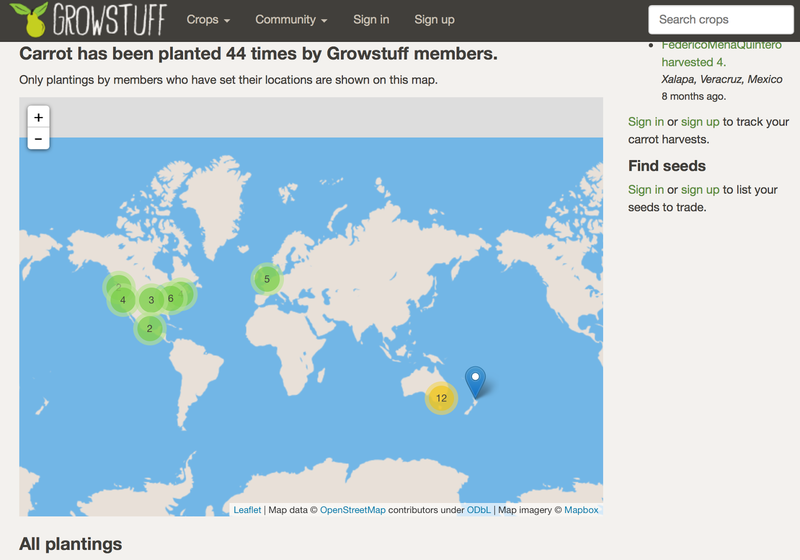 When I update this post (September 2014), Growstuff already provides you with embedded maps, to see on a global scale who else is growing and saving form the same species. 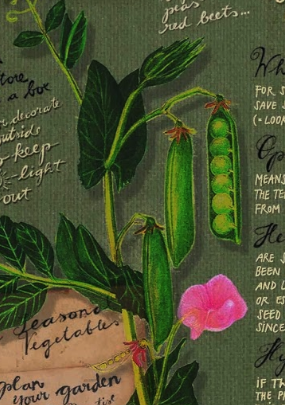 This is an important development for the seed saving movement, especially as they go open source. But you can not search for specific varieties yet. We should absolutely share what we grow and save from there though, to empower the developments and find others who grow close to us soon ! 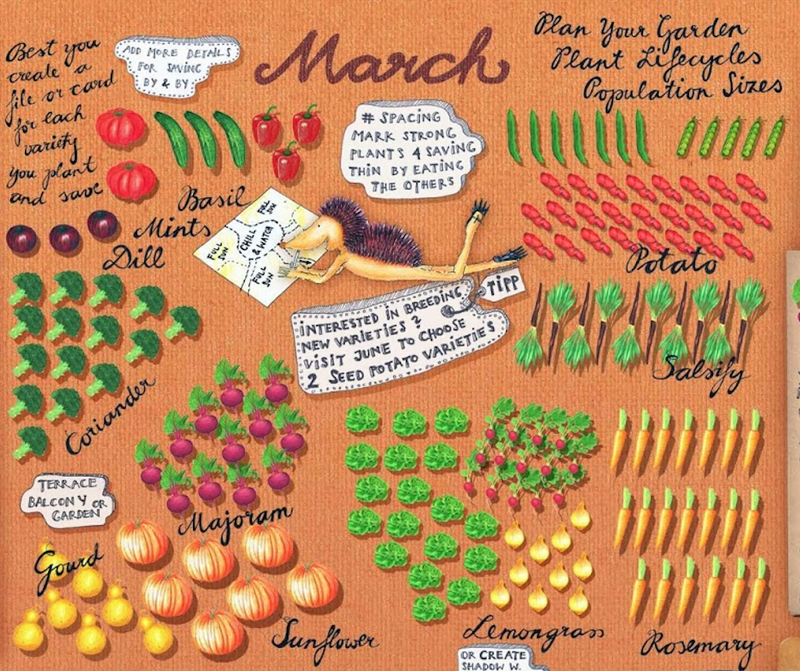 Yet, I still recommend to convince your gardening friends to organise your seed saving, mixing and sharing of specific varieties through Facebook groups, or similar simple social tools, but I will be happy to update the calendar once our desired platform is ready for convenience ! 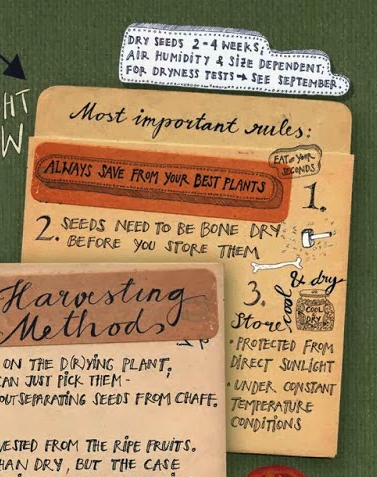 Tell your friends, who are or might be interested in growing their own food, medicine - or other flora - about your most recent "gems": the more of you plant a variety, the better you can start local seed saving. 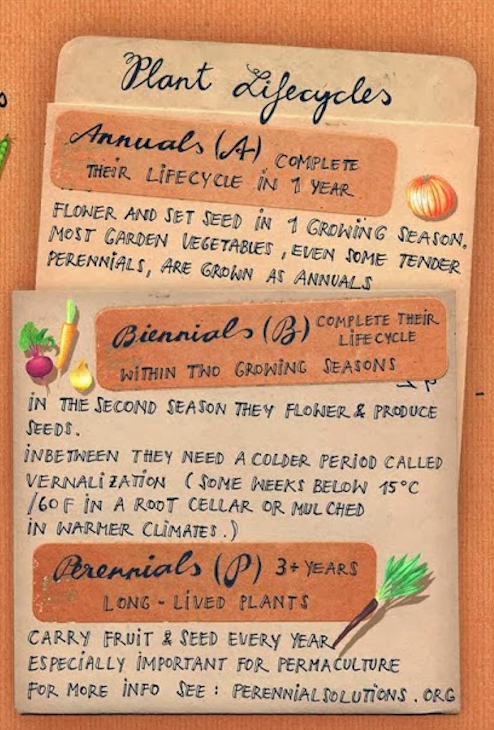 Once your friends are interested, a visual bookmarking tool becomes kind of necessary... pinterest is indeed a handy tool: curious gardening friends instantly love it because they can find a lot of pre-selected content for related topics. And you can create shared folders there. 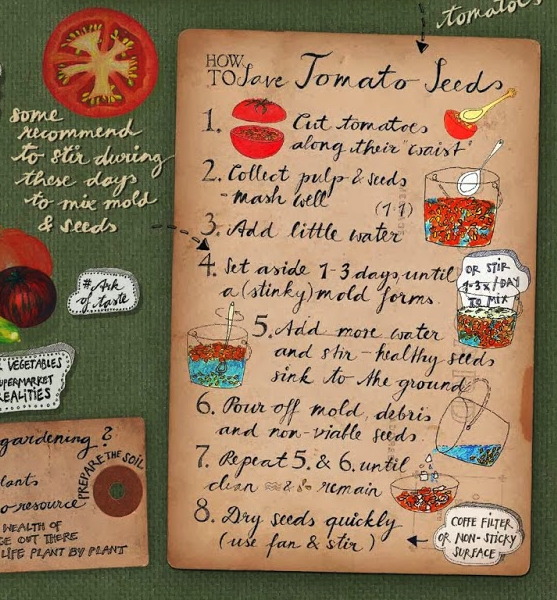 First, find some super-tasty organic, open pollinated tomatoes to kick off your seed saving journey - from a friend, a local organic farmer or farmer's market. Preferably a seldom variety, to support its maintenance and continuous improvement. 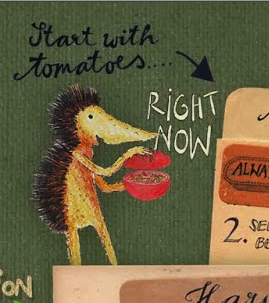 Once you have found your seed tomatoes: Let them become really ripe to save their seeds. Nearly over-ripe - soft, but still edible. If they are truly organic, that should not take too long, some days at room temperature. How-to cards are meant as "all-you-need summaries" for your actual saving process . 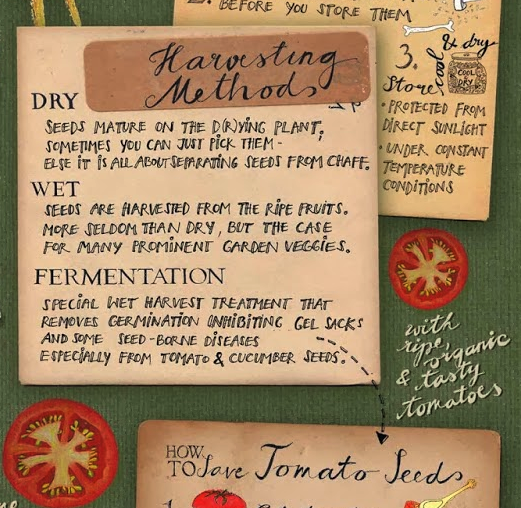 Tomato seeds are fermented, a special wet harvest treatment. Basically: set aside for some days before rinsing and drying to invite and host a beneficial fungus. 1. It breaks down the germination inhibiting gel sack. 2. 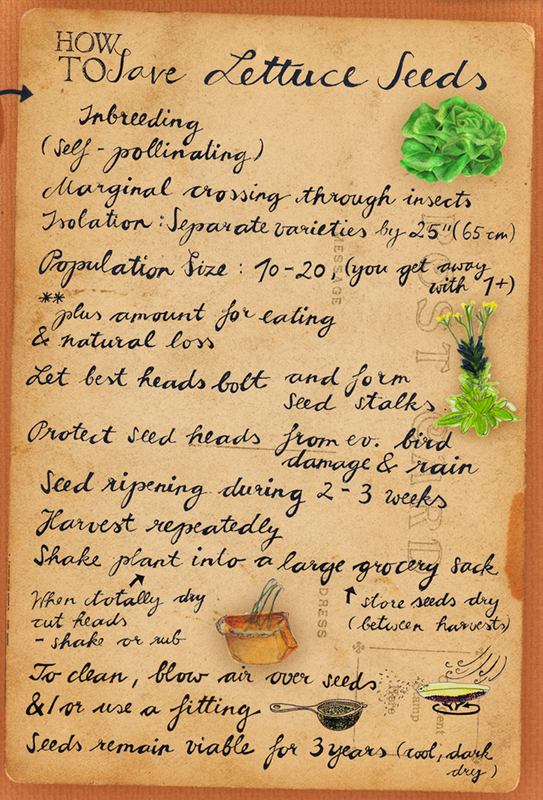 It prevents some seed-borne diseases. Cucumber seeds can not be harvested from the green fruits we eat - seed cucumbers need to be left on the vine far longer. Funnily our statistical favorites are actually more cumbersome for saving their seeds than all others, where it is not smelly and just about some different cleaning procedures, and off to dry. And altogether, saving their seeds takes just some minutes. Just some more breaks in between. from your deseeded tomatoes ! An honest word here: It might happen, that you buy vegetables which are labeled organic, but turn out to be: not organic. The further away we live from trusted farmers, the more saving seeds from ripe "organic" fruits can become a testing, trying, and experimentation field. 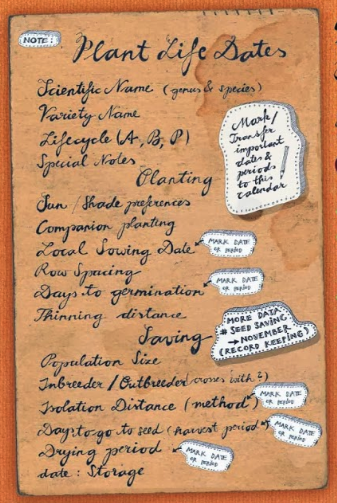 Unless you know your source is 100% trustworthy and that the variety you choose is open pollinated, be prepared to be an explorer in the field of testing organic promises. You might find out that your organic tomatoes where grown from hybrid seeds, after growing them, because they don't carry a lot of beautiful fruits like the ones you saved from. This should be less probable if you choose heirloom varieties. It is better to invest in some packets of organic seeds from trusted sellers to start from, if there is no seed bank or seed library close to you yet. 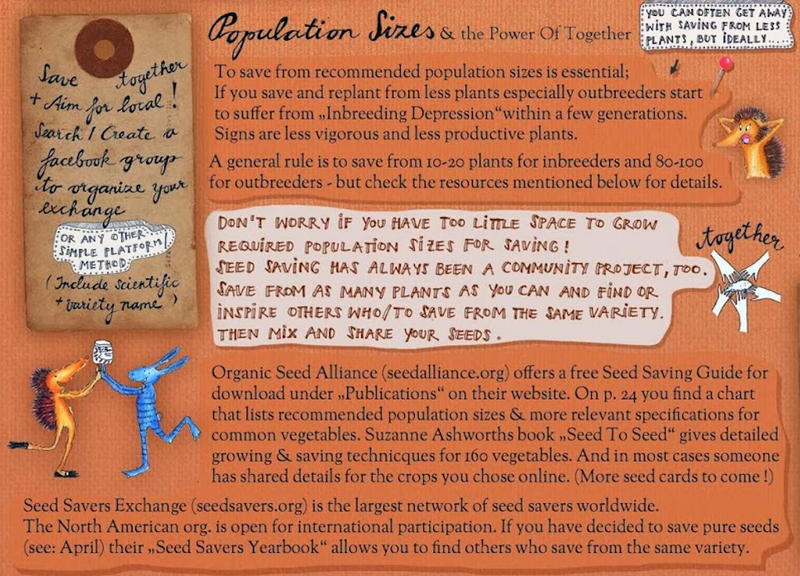 If you can convince some friends & neighbours to grow the same varieties, it becomes really simple to maintain healthy populations: all of you save from your best fruits, then you just need to meet up, mix and share your saved seeds. Your organic traders should ideally sell fruits grown from such seeds too, if they are truly organic - and for very sure fruits free of any chemical treatments, be it to slow down the ripening process or inhibit germination. But generally, views differ strongly about chemical treatments and purity questions as to my "on-ground research" - I personally want my seeds to be 100% organic. Let us label very clearly and be honest about our sources. 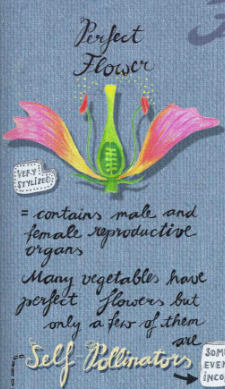 This helps altogether to save truly organic seeds separately from e.g. necessary compromise approaches.